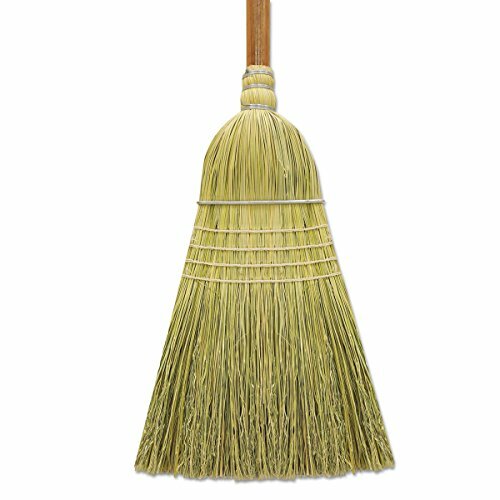 The O'Dell BR10002 corn/synthetic fiber warehouse broom has corn and synthetic fiber bristles, a wood handle, and a wider head than lobby brooms and is used for sweeping large, open spaces. The bristles are made of corn and synthetic fibers for flexibility and resistance to wear and certain solvents, and can be used indoors or outdoors to sweep rough or smooth surfaces. Four rows of stitching make the broom more durable than typical brooms with fewer stitches. The wood handle is heavier than typical polymer or metal handles and is better suited for moderate to heavy sweeping. The handle's lacquer finish resists wear. Wire wrapping secures the bristles to the broom handle. The broom measures 60" long overall. The handle measures 42" long and 1-1/8" in diameter. The broom head is 12" wide. O'Dell Corporation manufactures wet mops, dust mops, brooms, brushes, dusters, and other cleaning products. The company, founded in 1945, is headquartered in Ware Shoals, SC. Rubbermaid Dustpan 8-1/4 " X 12-1/4 " X 1-3-1/4 "